I am happy to announce a new book published by Hampton Roads, due in June of 2018. The Little Book of Sufi Stories retells some of my favorite stories, and a few you haven’t heard before. I am just finishing proofreading the final galleys and find that the publisher has done a beautiful job. I hope you enjoy it as much as I enjoyed writing it! Although the release is a little ways off, I would encourage you to pre-order it now using the links below. It will help create some early interest (that’s the way things work in our world) and you won’t find a better price later! As the German novelist and storyteller Hermann Hesse once wrote, the great stories of humanity—like fairy tales, Hasidic stories, Celtic stories, Zen stories and Sufi stories—provide us with incomparable examples of the “genetic history of the soul.” We share this depth of soul with all human beings. So, hearing a story live and unrehearsed brings us closer together, creating and re-creating our all-too-fragile sense of human community. I have drawn the stories in this book from the dozens that I have enjoyed telling in my teaching seminars over the past 30-plus years. 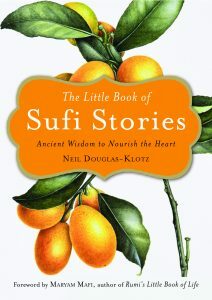 Most of them first appear in works of classical Sufis like Rumi, Attar or Sa’adi. Others simply come to us without a name, passed down from person to person with variations for hundreds of years. Telling an oral story in print is challenging. One can strip the story back to its bare bones, thereby losing much of its flavor and aroma. Or one can treat the story like a prehistoric insect caught in amber: one leaves all sorts of cultural detail in, but the story doesn’t breathe. I am a great fan of live storytellers, but some so-called professional storytellers err on the latter side, because they don’t understand the transmission of the story—its life as an inner experience that everyone can share. The “wow” factor may be there—the special effects—but not the wisdom. Likewise, some authors overly embellish or interpret Sufi stories with an agenda in mind (often psychological or theological). They map out the whole story as an allegory that supports a principle they want to convey. In my view, this is (as one Zen master commented) like going to a restaurant and ordering a vitamin pill. Where is the art of life, the joy of discovery? Hopefully, I have woven my way between the extremes. I have modernized the dialogue, and so there will be deliberately anachronistic references. Hint: this is one technique for using stories as spiritual teaching. Another technique: there will be plot elements that seem to end nowhere. A third: No ‘trigger warnings’ are given. Fourth: sometimes the good are not rewarded and the evil not punished (but that’s more like life anyway). I could go on, but why spoil the fun? Without doubt, there is nothing like hearing a Sufi story live. To tell one of these stories, I need to first live in it for a while, much as one might walk into an unknown forest and gradually get to know the plants and animals there. Yet when telling the story live, I can still meet something unexpected at any moment. As I mentioned in The Sufi Book of Life, I encourage readers to go beyond the book (or screen) to meet real Sufis. With a sincere heart, this is not so hard (which is not to say it’s simple, given that Sufis all over the world are under threat from Islamic fundamentalists). I hope these stories convey an aliveness that awakens a spark in your soul. If they do, you may become—as I am—a story collector. Hear and read more of them, retell them in your own way, and you may find yourself becoming a different, wilder, more completely human you. This entry was posted in News from Abwoon Network, News from Neil on December 14, 2017 by Neil Douglas-Klotz.